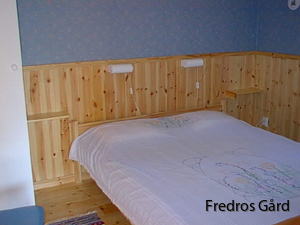 Our log cabins (65 sqm) have six beds each. Four of them are in two separate bedrooms and two of the beds are up on a cosy little loft (meant for older children). The cabins are fully equipped with a modern kitchen, satellite-TV, microwave oven, radio, fire place, WC and shower. 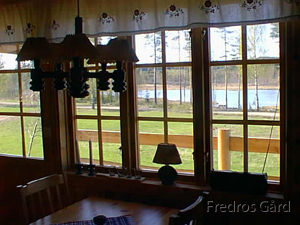 From the verandas you have a fantastic view over green fields and the calm water of the lake Treen. 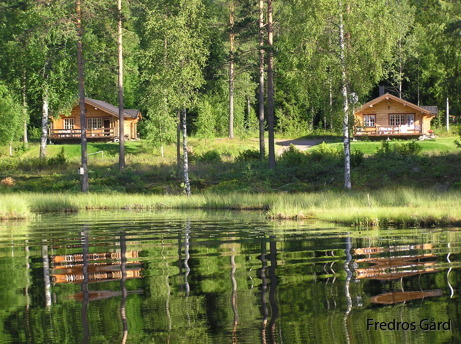 You have access to your own boat or canoe that is placed by the water, some 75 m from the cabins. 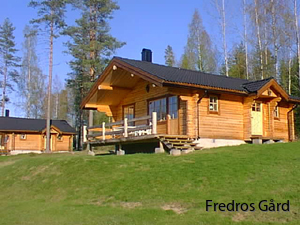 During the summer of 2010 a smaller closeby cabin has been restored into a sauna, where you also will have a possibility to wash and dry clothes. 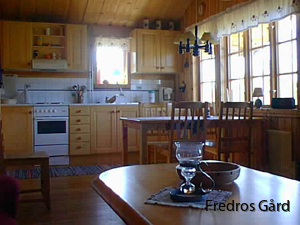 Regardless of the season, Fredros and these cosy log cabins are well worth seeing!